Underpinning is covered in Annex B.
BS EN 1997-1:2004+A1:2013, Clause 6, and Clause 4 and Clause 5 (this clause) of this standard. NOTE Information about shallow (i.e. spread) foundations can be found in the ICE manual of geotechnical engineering (2012), Volume II, Chapter 53 .
the need to found in stable soil. NOTE Adjacent pad foundations may be combined or joined together with ground beams to support eccentric loads, to resist overturning, or to oppose horizontal forces. Walls between columns may be carried on ground beams spanning between pad foundations. 5.1.1.3 When the plan area covered by pad and strip foundations exceeds more than about one half of the superstructure footprint, consideration should be given to using a raft foundation instead. NOTE Some key features of pad, strip, and raft foundations are summarized in Table 6. A pad foundation is a spread foundation whose length (L) and breadth (B) on plan are of similar magnitude (L ~ B). Pad foundations are commonly used to transmit structural loads onto a suitable bearing stratum at shallow depth below ground level. They are the simplest of all foundations and are generally used where groundwater is absent or can be readily controlled. 5.1.2.1 Pad foundations may be of various shapes, including circular, square, or rectangular. The shape of a pad foundation should be chosen to accommodate the effect of eccentricity arising from imposed moments and shear forces on the column and the method of construction. NOTE Deep pad foundations (>3 m deep) may be used to carry heavy column loads. 5.1.2.2 The thickness of a pad foundation should not be less than 150 mm. A strip foundation is a spread foundation whose length on plan (L) is very much greater than its breadth (B), i.e. L >> B. Strip foundations are commonly used to support the walls of buildings. They are generally used where groundwater is absent or can be readily controlled. 5.1.3.1 On sloping sites, strip foundations should be founded on a horizontal bearing and stepped where necessary to maintain adequate depth. 5.1.3.2 The thickness of a strip foundation should be not less than 150 mm. 5.1.3.3 The breadth of a strip foundation should be chosen, taking into account normal construction tolerances (see 5.2), so as not to overstress the ground beneath it. A raft foundation is a spread foundation whose length (L) and breadth (B) on plan are similar to that of the superstructure. Raft foundations are commonly used to support large or heavily loaded structures. They can prove to be a very cost-effective foundation solution. 5.1.4.2 Settlement of raft foundations may be reduced by providing piles that redistribute loads from the upper layers of the ground to deeper strata. NOTE Information about rafts can be found in the ICE manual of geotechnical engineering (2012), Volume II, Chapter 56 . The design of concrete spread foundations cast directly onto the ground should take into account the permitted sectional deviations given in BS EN 13670. Design and construction considerations for spread foundations are given in BS EN 1997-1:2004+A1:2013, 6.4. The design considerations given in this clause are more specific examples of the issues that can affect the performance of a spread foundation. the possibility of damage caused by the presence of chemicals. 5.3.1.2 Specialist advice should be sought where sensitive clays and loose water-bearing sands and soils that change structure when loaded are expected. 5.3.1.3 Whenever possible, the centre of area of a foundation or group of foundations should be located directly beneath the centre of gravity of the imposed load. When this is not possible, the effects on the structure of tilting and settlement of the foundation should be considered. 5.3.1.4 Where foundation support is provided by a number of separate bases these should, as far as practicable, be proportioned so that differential settlement is minimal. 5.3.2.1 Strip foundations of traditional brick and masonry buildings should be founded at a depth where the anticipated ground movements will not impare the stability or serviceability of any part of the building, taking due consideration of soil type and the influence of vegetation and trees on the ground. increased in order to transfer the load onto satisfactory ground or where trees are located nearby. NOTE 1 Information about low-rise buildings on shrinkable clay soils can be found in BRE Digests 240  and 241 . Consideration of trees and other vegetation in the design of spread foundations should conform to 4.2.3.4. Traditionally in the UK, foundations have been taken to a depth of at least 450 mm below ground level to avoid frost heave. The design of foundations to avoid frost heave should conform to BS EN ISO 13793.
fill or other soils containing combustible materials. 5.3.5.2 Where excessive heat would otherwise be transmitted, the installation should be isolated from the soil and the foundation by a suitable form of construction. Where the installation is small, insulating materials might be adequate but some form of forced ventilation or cooling by circulated water might be required. BS EN 1997-1:2004+A1:2013, Annex D, presents a sample analytical method for bearing resistance calculation that does not include depth, ground inclination, or rigidity factors. This clause gives an alternative method that includes these factors. The design of spread foundations from ground parameters should conform to BS EN 1997-1:2004+A1:2013, 6.5.2.2. 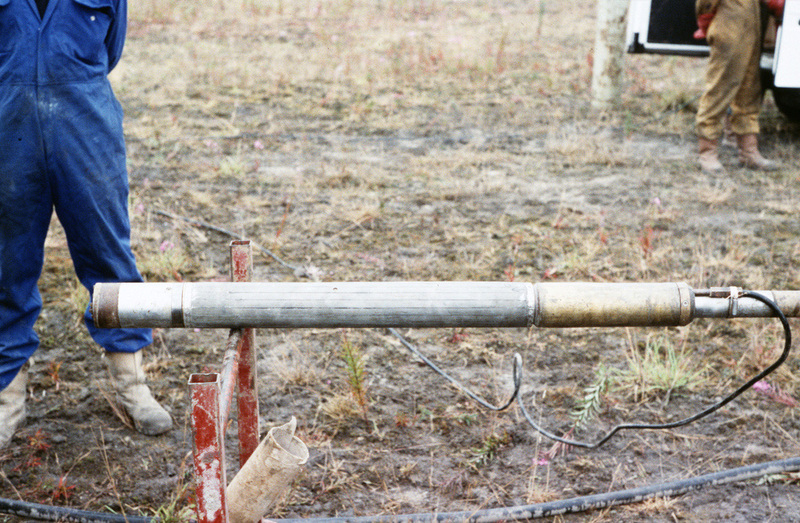 NOTE Care is required in assessing submerged weight density term γ', particularly when groundwater is close to the foundation. 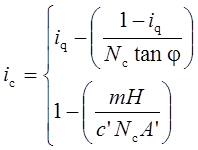 σ'v is the vertical effective stress on the foundation. NOTE 1 The expressions given for Nc and Nq are identical to those in BS EN 1997-1:2004+A1:2013, Annex D. The expressions given for the shape, load inclination, and base inclination factors are also identical to those in Annex D, except for sq and sγ. The expressions given for dq, gq, and rq, etc. are missing from Annex D.
NOTE 2 The expression given for Nγ is one of many that have been proposed in the geotechnical literature. The expression given (after Poulos ) is generally conservative when compared to other expressions. 5.4.1.2.9 The effects of load combinations involving large inclinations of force or large moments should be assessed using more advanced calculation models than those given in BS EN 1997-1:2004+A1:2013, D.4, or this clause. NOTE Information about more advanced bearing resistance models can be found in the ICE manual of geotechnical engineering (2012), Volume I, Chapter 21 . 5.4.1.2.10 A concrete foundation cast directly against the ground may be considered «rough»; pre-cast concrete foundations should be considered «smooth». 5.4.1.3.1 The ultimate bearing resistance of a spread foundation on fine soils should be calculated as the smaller of its undrained and drained bearing resistances. 5.4.1.3.2 Under undrained (usually short term) conditions, the ultimate bearing resistance of a spread foundation on fine soils should typically be calculated using total stress parameters. 5.4.1.3.3 Under drained (usually long term) conditions, the ultimate bearing resistance of a spread foundation on fine soils should be calculated from effective stress parameters, as described in 5.4.1.2. D is the depth to the underside of the foundation. 5.4.1.3.5 This expression should not be used if the ground surface, the applied load, or the base of the foundation is inclined. NOTE 1 When the ground surface is inclined, omission of a ground inclination factor from the expression for Rv above is potentially unsafe. NOTE 2 When the load is inclined, omission of a load inclination factor from the expression for Rv above is potentially unsafe. NOTE 3 When the base is inclined, omission of a base inclination factor from the expression for Rv above is potentially unsafe. Any earth pressure that is included in the sliding resistance of a spread foundation should be calculated at a strain level that is compatible with that assumed in the calculation of shear resistance along the foundation base. The magnitude of the settlement that will occur when foundation loads are applied to the ground depends on the rigidity of the structure, the type and duration of the loading, and the deformation characteristics of the ground. NOTE Guidance on the calculation of settlement for a shallow (i.e. spread) foundation can be found in the ICE manual of geotechnical engineering (2012), Volume II, Chapter 53 . The design of many simple foundations has traditionally been checked against «allowable bearing pressures» which are normally very conservative estimates of the ultimate bearing resistance of the ground, selected on the basis of soil and rock descriptions. The settlement of a spread foundation that has been designed using allowable bearing pressures is commonly assumed to be acceptable. In BS EN 1997-1, «allowable bearing pressures» are now called «presumed bearing resistance» and this method of design is termed a «prescriptive method». Spread foundations may be designed using prescriptive methods based on presumed bearing resistance. γRv,SLS is a partial factor on bearing resistance. 5.4.4.2.2 For foundations not exceeding 1 m in width that are subject primarily to permanent laoding, a value of γRv,SLS ≥ 2.0 should be adopted. 5.4.4.3.2 For foundations not exceeding 1 m in width that are subject primarily to permanent loading, a value of γRv,SLS ≥ 3.0 should be adopted. Suggested values for the presumed design unit bearing resistance (qRv,pres,d) of square pad foundations on rock (for settlements not exceeding 0.5% of the foundation width) may be obtained from BS EN 1997-1:2004+A1:2013, Annex G.
Concrete and related products incorporated into spread foundations should conform to 4.3.6. Steel and related products incorporated into spread foundations should conform to 4.3.7. Timber and related products incorporated into spread foundations should conform to 4.3.8. Fill incorporated into spread foundations should conform to 4.3.3. The durability of concrete used in spread foundations should conform to 4.4.2. The durability of steel used in spread foundations should conform to 4.4.3. The durability of timber used in spread foundations should conform to 4.4.4. 5.7.1.1 The ultimate limit state design of spread foundations should conform to 4.6 and this subclause (5.7). 5.7.1.2 The ultimate limit state design of a foundation should conform to BS EN 1997-1:2004+A1:2013, 6.5. The design value of the ultimate bearing resistance of a spread foundation (Rd) should be verified according to BS EN 1997-1:2004+A1:2013, 6.5.2, and conform to expression (6.1) of that standard. 5.7.3.1 The design value of the ultimate sliding resistance of a spread foundation (Rd) should be verified according to BS EN 1997-1:2004+A1:2013, 6.5.3, and conform to expression (6.2) of that standard. 5.7.3.2 For drained conditions, Rd should be calculated according to expression (6.3a) of BS EN 1997-1:2004+A1:2013 in preference to (6.3b). 5.7.3.3 For undrained conditions, Rd should be calculated according to expression (6.4a) of BS EN 1997-1:2004+A1:2013 in preference to (6.4b). Overturning of a spread foundation should be prevented by verifying ultimate limit state EQU in accordance with BS EN 1997-1:2004+A1:2013, 2.4.7.2 and the UK National Annex to BS EN 1997-1:2004+A1:2013. The global stability of a spread foundation should conform to BS EN 1997-1:2004+A1:2013, 6.5.1. The serviceability limit state design of a foundation should conform to BS EN 1997-1:2004+A1:2013, 6.6. 5.9.1.1 The structural design of a foundation should conform to BS EN 1997-1:2004+A1:2013, 6.8. 5.9.1.2 Spread foundations may be constructed using reinforced or plain (i.e. unreinforced or mass) concrete. 5.9.1.3 The design of reinforced concrete spread foundations should conform to BS EN 1992-1-1. 5.9.1.4 The design of plain (i.e. unreinforced) concrete spread foundations should conform to BS EN 1992-1-1:2004+A1:2014, Section 12.
steps occur between adjacent ground floor slabs or finished ground levels. The thickness of the foundation should not be less than 150 mm. Reinforcement should be provided in strip foundations wherever an abrupt change in load or variation in ground support occurs. The structural design of a raft foundation should take into account the reduction in strength caused by holes, ducts, etc. used to accommodate service pipes, drains, and such like. NOTE Attention is drawn to Regulation 22 of The Construction (Design and Management) Regulations, 2015 , with regards to health and safety requirements for excavations. The execution of concrete spread foundations should conform to 4.9. 5.11.1 Testing of a spread foundation should conform to prEN ISO 22477. 5.11.2 Plate loading tests should conform to prEN ISO 22476-13. Supervision, monitoring, and maintenance of a spread foundation should conform to 4.11. Reports for spread foundations should conform to 4.12. The hole can be pre-formed, or made by the pressuremeter itself by tunnelling or pushing. The instrument is a miniature tunnelling machine that cuts a hole into which the probe very precisely fits.